Waking Lazarus by T. L. Hines, a Mysterious Review. 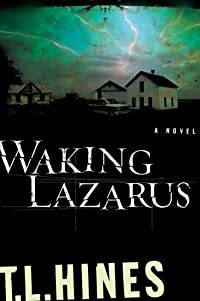 Review: Waking Lazarus is T. L. Hines' debut thriller about Jude Allman, a man who must come to terms with his unique abilities while the local community is endangered by a serial kidnapper. Hines has a real talent for dialog, setting, and pace. He has crafted a superb mystery deftly incorporating spiritual and paranormal elements into the story. The characters are well defined, and their interpersonal relationships believable. These are important elements that lend credibilty to the story as some of the Jude's abilities may seem somewhat implausible. It's often difficult to understand what drives someone to commit a crime against a child. In Waking Lazarus, children are disappearing and, presumably, being murdered. Hines neatly, and a bit unfairly, sidesteps this issue by stating, in precise terms, that the perpetrator is not human. This is not meant to be taken literally, but in the context that anyone who does harm to a child cannot be human in the eyes of the community. Yet, Hines provides the kidnapper / killer with a split personality (the Hunter and the Normal) effectively supplying a medical and, perhaps, legal excuse for the crimes. It would have been far more terrifying had the villain simply been depicted as an average, albeit evil, individual. There are many literary reasons to pick up a copy of this book. Foremost among them, Hines is a gifted writer and Waking Lazarus is a fine example of inspirational mystery fiction. Acknowledgment: Breakthrough Promotions provided an ARC of Waking Lazarus for this review.